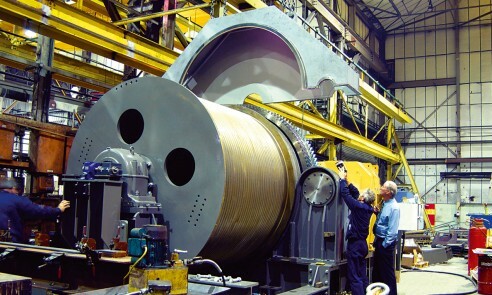 Tata Steel has commissioned Qualter Hall to build an upgraded replacement Skip Car Winch for Port Talbot steelworks. Qualter Hall is to supply a replacement 2 x 1250kW Skip Car Winch, designed for both single and double motor operation, for the 2012 re-build and upgrade of their No 4 Blast Furnace. Its function is to hoist fully-laden skips to load the furnace. This is to be the largest Skip Car Winch in the UK, so defined because it will carry the heaviest loads at the fastest speeds. The existing Skip Car Winch to be replaced, was supplied new by Needham Brothers, now a Qualter Hall Company, in 1992 and will have been in service for 20 years at the time of this year's re-build. The work is taking place over a very intensive 10 month period and will include the design, manufacture, testing, site installation and commissioning, along with the dismantling and removal of existing equipment. The new Winch will incorporate new improvements including a substantial increase in load capacity and also a more efficient time cycle. Qualter Hall was selected, over other companies, to undertake the work due to their past track record in successfully supplying previous Skip Car Winches for Port Talbot and other Tata steelworks, along with their continued and highly responsive maintenance support.